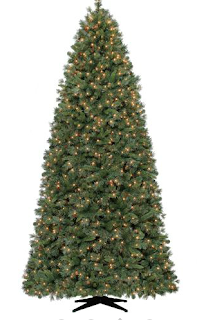 Hurry and order the Holiday Time Pre-Lit 9' Quick Set Artificial Christmas Tree for only $31.00 + FREE Store Pickup! This is a fabulous deal on any Christmas Tree! Use zip code 62221. Celebrate Christmas with this beautiful nine-foot tree that features pine cones and 1200 clear lights. Width at base of tree: 56"